Did you know that Sherlock Holmes has been depicted in the movies more than any other fictional character throughout cinematic history? Yeah. It's fairly elementary, don't you know. You just ask any of those nice chaps seen in the following 75 minute flick made in 1935. It was Directed by: Leslie S. Hiscott; and Starred: Arthur Wontner, Lyn Harding, with Leslie Perrins. 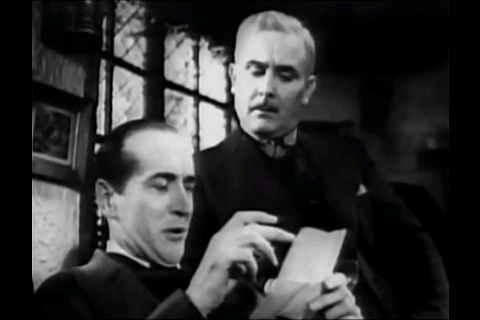 Why thank you very much for coming out of retirement to investigate the death of my husband, Mister Holmes (Arthur Wontner). Yet, to be completely honest with you, I had a sneaking suspicion something like this was going to happen sooner or later. You see, many years ago, whilst we were living in America, my late husband John (Leslie Perrins) joined a gang of crooks who frequented a nearby tavern. And I'll tell you something for nothing, Sherlock, this motley crew were really up to no good. Extortion. Thievery. The works. They did everything in their power to make a fast buck in spite of the local authority's best efforts. However, as time past John finally decided to show his true colors. And this in turn resulted in some of the gang being pinched, whilst me and my other half made it all the way back to England for safe keeping. Well. We thought we were, anyway. But then again, that's most probably why what next transpires all goes old-school when Doctor Watson (Ian Fleming) catches me laughing in the garden. As the game is a foot - a string of lies goes kaput - a dead man eventually join's the party - and at the end of the day, look out Holmes, for here comes Professor Moriarty (Lyn Harding)! From a narrative point of view I'd say 'The Triumph of Sherlock Holmes' was a story of two unequal halves. Whilst one part of its concentrated on Holmes trying to figure out who murdered a man, the other part of it concentrated on the man's back-story and eventual fate. Now I know that this may sound fairly straight forward and pedestrian on the surface, dear reader. But as I just said, the two halves presented were very unequal. Essentially it favored the 'back-story' part of the narrative more than the 'Holmes' part of the narrative, and this inadvertently made the 'Holmes element' act as a book-end to the overall murder mystery. I also noticed that the exposition came across somewhat top-heavy on occasion. And even though I did like the way the actors acted -- all upper-crust, working class, or prim and proper -- in the same breath some of them weren't able to give their words any form of gravitas or depth. Of course I'm not referring to Arthur Wontner or Ian Fleming's performances. Generally speaking their portrayal of Sherlock and Watson was very warming on the screen. As a matter of fact, not only was it warming, my friends, I'd even go so far as to say their on screen chemistry felt more authentic than some of the other actors who have attempted to play these parts. Well. Let's face it. Doesn't Arthur look like Sherlock Holmes to you? Furthermore, if you ever get around to watching any of his movies, I bet you anything you'd think he sound's like him as well! Especially when he does one of his summations to explain why x did y to z! Anyway. I'm sure you know by now my feelings towards this fairly good murder mystery. So I tell you what. Why don't you now sit back, relax, and check out the following filmic-facts. (1) 'Gaumont British' first released this production in England on the exact same month the 'Monopoly' board game was first sold in the shops -- February, 1935. (2) Loosely translated, this project was entitled 'The Valley of Fear' in Spain. 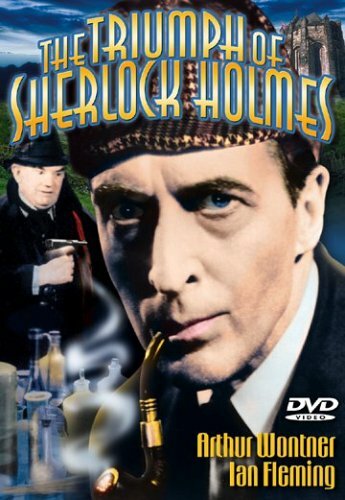 (3) Funnily enough, you might like to know this adventure was limply based on Sir Arthur Conan Doyle's final novel-length Sherlock story -- also entitled 'The Valley of Fear' -- which was published in 1914. (4) One of the taglines used to promote this picture, was, 'Sherlock Holmes solves his greatest problem of his spectacular career'. (5) That nice English chap who directed this film, Leslie S. Hiscott, was one of the original co-founders of the legendary 'Twickenham Film Studios'. (6) This was the last time Cyril Twyford ever adapted a flick for the silver screen. 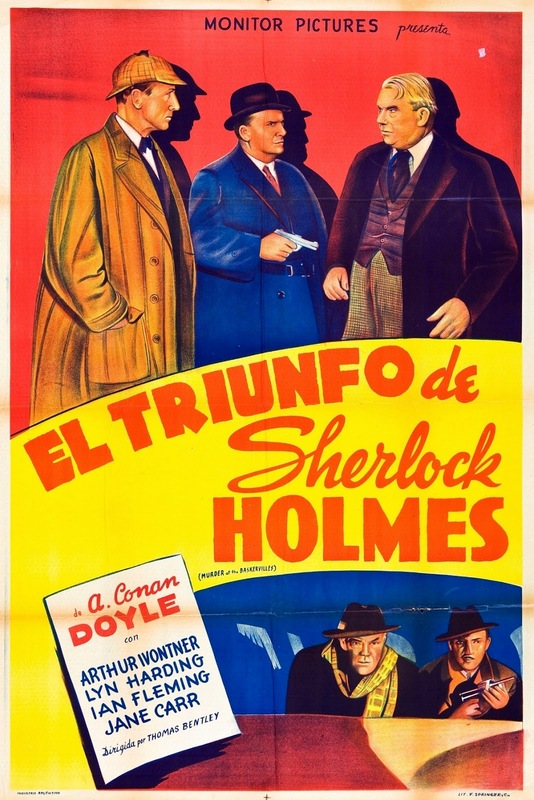 Previously he adapted two other Sherlock Holmes mysteries starring Arthur Wontner, most notably 'Missing Rembrandt' and 'Fatal Hour'. (7) In stark contrast to Cyril, this was the first time Lyn Harding ever portrayed Professor Moriarty. 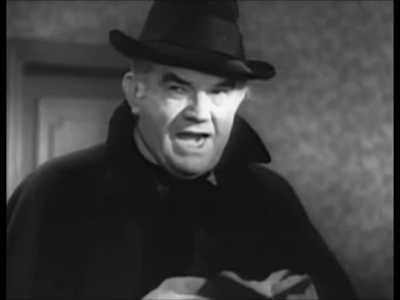 Afterwards he would play him one more time in 'The Silver Blaze'. (8) After this mystery gulped its last sip of tea, Arthur Wontner starred in the drama, 'Line Engaged'; Lyn Harding starred in the adventure, 'Escape Me Never'; and Leslie Perrins starred in the romance, 'D'Ye Ken John Peel?'. Overall I'd say 'The Triumph of Sherlock Holmes' was a rather pithy little footnote on the whole Sherlock Holmes mythos. Even though the back-story overpowered Sherlock's presence, as push comes to shove Sherlock and Watson still made it through despite its bi-polar tone. A timely tone. Nuff said.